HumanWare has debuted a notetaker designed for students who are blind. The new BrailleNote Apex is small, a thin (0.78"), and light (1.8 lbs. ), making it easy to carry and use. 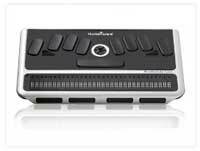 It features a full-size Braille keyboard, 8 GB of internal memory, built-in WiFi, Ethernet, and Bluetooth. The BrailleNote Apex also supports high-capacity SDHC cards and has four high-speed USB 2.0 ports. The notetaker runs on Windows CE 6.0 operating system with KeySoft productivity applications that feature 100 percent accessibility. The BrailleNote Apex also has thumb keys designed to make extensive reading easier. BrailleNote Apex is available now. Further information can be found here.